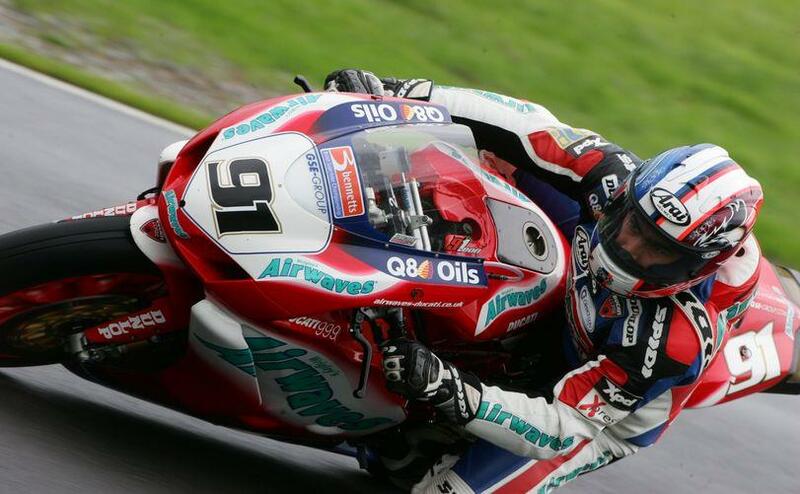 Leon Haslam took his first win of the 2007 British Superbike season in dominant style on the Airwaves Ducati, leading from start to finish at Mondello Park, despite finishing just 0.158 seconds ahead of Stobart Honda's Shane Byrne. It was a good race at the Irish track for the Airwaves Ducati team, as Gregoro Lavilla was able to finished third, despite only starting from the third row of the grid due to poor qualifying and a crash on the Friday of the race weekend. Haslam was able to lead from the start, with pole position rider Jonathan Rea in second on the HM Plant Honda, with team-mate Ryuichi Kiyonari in third and Shane Byrne in fourth. Meanwhile Gregorio Lavilla had already moved up to seventh place. As the race continued the lap record was repeatedly broken by Lavilla, Rea and Byrne. Shane Byrne was able to reel in both the HM Plant Hondas, with Kiyonari dispensed on lap seven, followed by Rea on lap ten, and then closed on race leader Leon Haslam. behind Byrne Gregorio Lavilla was also moving up into fourth place. Despite his best efforts, Byrne couldn't find a way past Leon Haslam on the final lap, but Gregorio Lavilla continued his move forwards, passing Jonathan rea and taking the final podium spot. Rea finished fourth, with HM Plant Honda team-mate Ryuichi Kiyonari in fifth. With Ducatis first and third, it was all Hondas down to the Rizla Suzuki of Cal Crutchlow in eighth place.